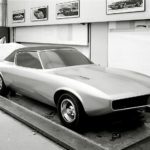 V12 CAMARO: GEN I 12-CYLINDER PONYCAR! 1967-2016 CAMAROS: PACING THE INDY 500! ’16 CAMARO RAGTOP: LET THE SUN SHINE IN!